Last month the lovely / incredibly cool Laura gave me a tour of the Woodie’s Tallaght branch to help brainstorm some ideas for my first project with them. We excitedly agreed the first project should be Valentine’s based, and thought of all that could be DIYed for the big day. Most importantly, we wanted it to be an easy project that really made an impact. We checked our calendars and when we realized Valentine’s Day landed on a Saturday this year, we knew something for breakfast in bed would be perfect. Woodie’s wooden tray was a perfect canvas for the project. 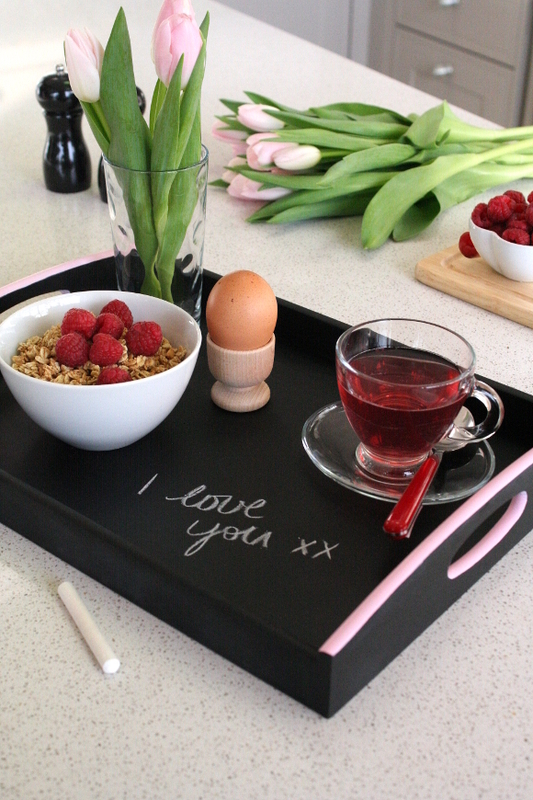 I did a lot of head scratching and finally thought – why not paint it in chalkboard paint so sweet nothings could be scribbled all over it; perfect for a romantic breakfast in bed! BOOM. A simple DIY that makes a statement. Literally. 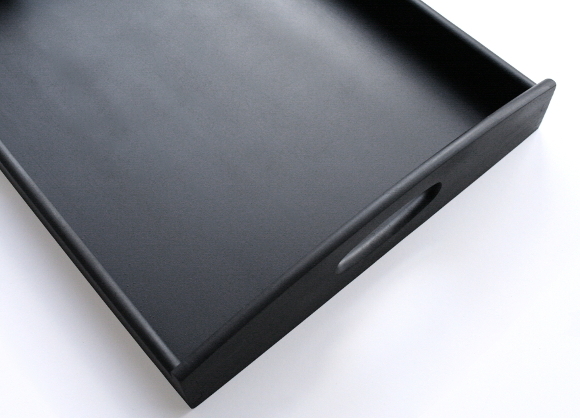 Give your tray a thorough clean with a damp cloth or paper towel. 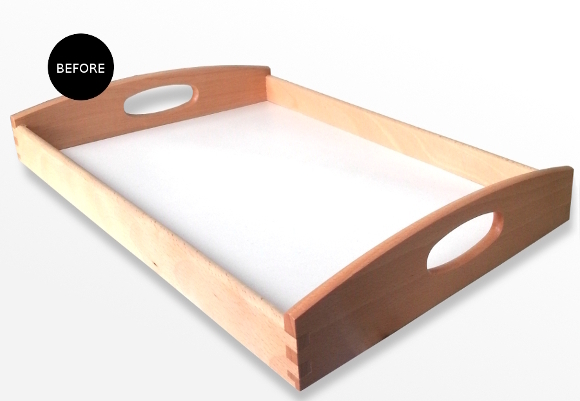 Allow your tray to dry before you continue onto the next step. In a well ventilated area, lay down plenty of newspaper to cover and protect any surfaces. Following the instructions on the can, shake the can thoroughly and with your gloves on, holding the tray upright with the can roughly 30cm away, begin spraying in a steady back and forth motion, overlapping with each line. Take your time and spray the paint thinly. 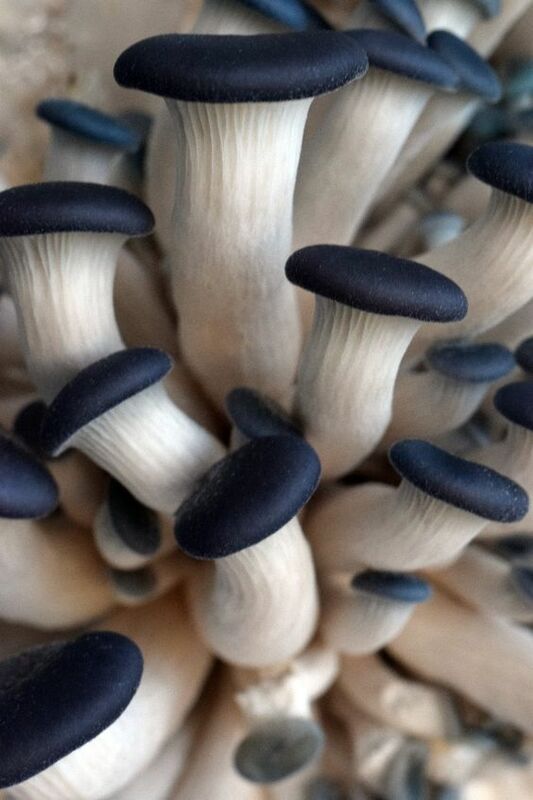 Allow to dry for 30 minutes before applying a second coat. If you’d like to add colour detail to the handles, do this after the second coat of paint has dried. I used a small paint brush to add detail, but this isn’t necessary. 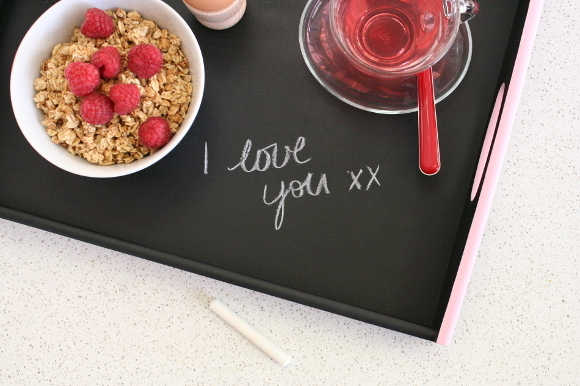 When adding any chalky messages, don’t write too heavily and make sure the chalk isn’t too sharp; if you use a sharp piece of chalk it may etch into the paint. After breakfast is served and devoured, to remove your message, simply use a damp paper towel or cloth to wipe it clean. It took me around an hour to do this project, from start to finish. A simple project, but a statement nonetheless. And I should say everything you see in the photo shoot was sourced from Woodie’s. Especially that kitchen. This project was especially memorable as it was DIYed, styled, photographed, edited and written by yours truly. But more so, working with a company like Woodie’s and with people like Laura who are equally excited and nerdy about home improvement and all things DIY, really is inspiring and so exciting. Congratulations on your first project for Woodies! 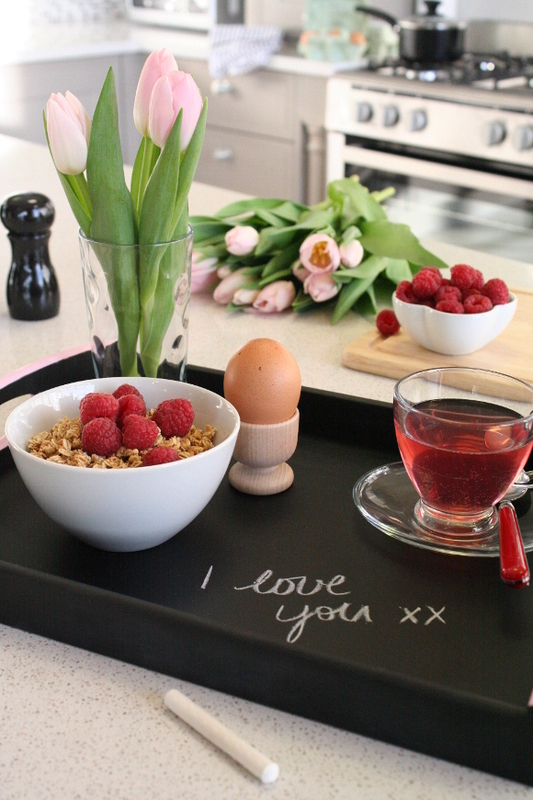 A very cute DIY, and I love the styling. Painting the edge and handles is such a great idea, it really makes it. That pink looks such a pretty contrast to the black! Looking forward to more great ideas!! I love the styling and your photos are nothing short of stunning! Wow, thank you Josie. I'm always learning how to improve my game, so it's all still very much a learning experience for me.